Alford, Richard N. Sr., 85, of Beaver, died July 26. J.T. Anderson Funeral Home, Beaver. 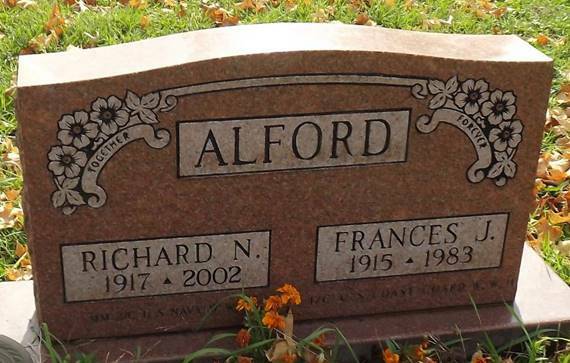 AAFA NOTES: SSDI records show that Richard N. Alford (SS# issued in PA) was born 2 Jan 1917, last residence Beaver, Beaver Co., PA.
We included the obituary of his sister Mildred Kay Alford in Pennsylvania Obituaries. Richard is the father of David William Alford, AAFA #1352. From SSACI: Richard Neadom [sic: Needham] Alford was born 2 Jan 1917 in Freedom, Beaver Co., PA, son of Homer L. Alford and Charlotta J. Brittain. His lineage: Richard Needham 1917 PA1, Homer Lee 1883 TX2, Needham Judge 1857 TX3, Jesse Powell 1828 LA4, Needham Judge 1789 NC5, Jacob 1761 NC6, Julius 1717 VA6, James 1687 VA7, John 1645 VA7.